My heart broke this afternoon when I received a news update from the Sacramento Bee saying that television icon, Huell Howser, passed away yesterday, reportedly from a long term illness. Howser was 67 years old and had recently announced his retirement. Julie and I have, for uncounted years, watched this man describe a state we love with beautiful photography and that down home style that no one else could ever match. Visions of Mayberry would always invade my thoughts as we heard his gentle Tennessee drawl spiel amazement in that aw shucks kind of way he had. He never went anywhere that he couldn’t find something even vaguely interesting and make it seem like the most important and fantastic place he had ever visited. Howser was not just a television personality who produced interesting shows, though. He took such an interest in historical buildings that, at one point, he filed a lawsuit to prevent the destruction of buildings built by African-American architect Paul Williams on the Long Beach Naval Station. The suit was thrown out of court and, of course, progress pursued its’ course. But, the effort demonstrated Howser’s commitment to “walk the walk” when it came to the history he was preserving through film. My afternoon with Huell went very well and was actually a lot of fun. He’s every bit as energetic as he appears on his show and he runs the taping at his rapid-fire pace using the info he finds interesting. It was just Huell and one cameraman and the rest of us running after him as he crisscrossed El Camino, ignoring the stoplight and traffic. He was late getting to the museum but took great care in setting everything up, including the opening remarks with me. As we stood chatting in front of the camera out on the corner of Main and El Camino, just about everyone who drove by waved and yelled hello to him. He was equally as friendly, waving and smiling. 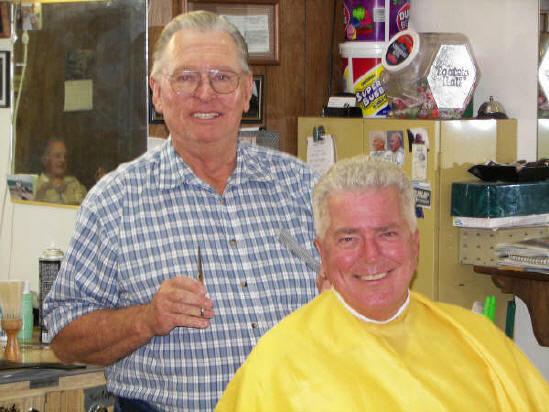 Gordon Bean, our Old Town Barber at the Wooden Indian (best haircuts in town, by the way) is posted on the wall across from where I get my haircut. I still marvel at that photo when I stop by there. Howser was thrilled by the hidden treasure that was Tustin and presented our town to the rest of the world. Howser’s passing now bring a regret to me. A year or so ago, I was sitting with a friend at a local Santa Ana restaurant. 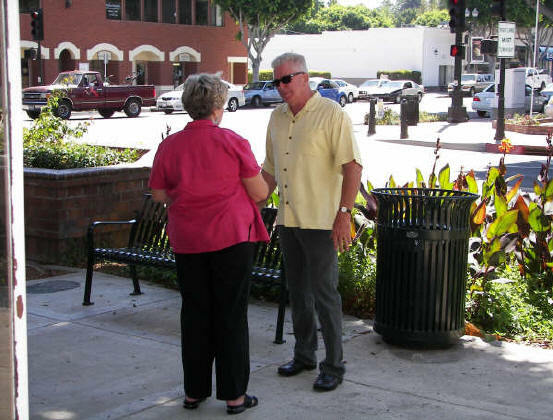 It was a nice day and we were smoking on the patio when I saw Huell Howser speaking with someone. I really wanted to go over and say hello, just to say I met him, and I didn’t because it looked like they were talking business. A shame, because now I will never have the opportunity to meet someone whose passion for the eclectic brought me such pleasure. Posted on January 7, 2013, in In the News, nonpolitical and tagged blacksmith shop, california gold, celebrities, huell howser, icon, Old Town Tustin, Tustin, utt juice building. Bookmark the permalink. 3 Comments. Such sad news… Denese had a special fondness for her fellow North Carolinian. I think he was a Tennessean, but yeah I am very sorry to hear this. You are correct, Matt. Huell was from Tennessee.